HomeWhen is A Capacitor not a Capacitor? When is A Capacitor not a Capacitor? This is not a riddle but a painful reminder of how un-ideal a capacitor can perform in real world circuit conditions. I measured the capacitance and Q factor for these capacitors shown below on a Agilent 4263B LCR meter, using 100Hz and 100Khz frequencies. At 100Khz things get really interesting : The 1000uF is now -.1 uF which is actually an inductor! The .01uF is .0098uF and the Q has gone down to 35. The nominal 10 uF(8.6) is now 8.2uF- not bad but the Q is down to 3. Finally the .1uF tantalum is now a .05uF with a Q of 1.2. So even with this modest change in frequency, we can see capacitance starts to decrease as stray inductance becomes more of an effect. Also all of the capacitors start to become more lossy( low Q). The bottom line here, especially with regard to decoupling, one large cap will not work well in most applications. 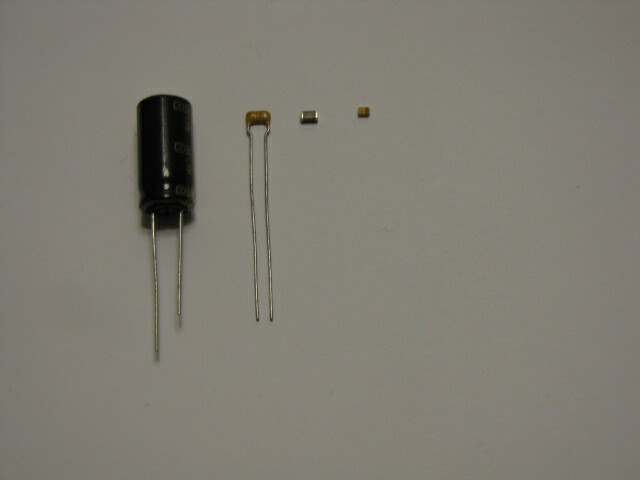 One may have to use a combination of different type and value capacitors to achieve intended results.